Top left photograph: Lake Fork Creek, Site LF-0 just downstream from Sugarloaf Dam showing stream gage and tubing carrying injectate solution. Hydrologist is collecting equal width increment (EWI) sample. Middle photograph: Lake Fork Creek, Site LF-100, looking downstream. Hydrologist is collecting equal width increment (EWI) sample. 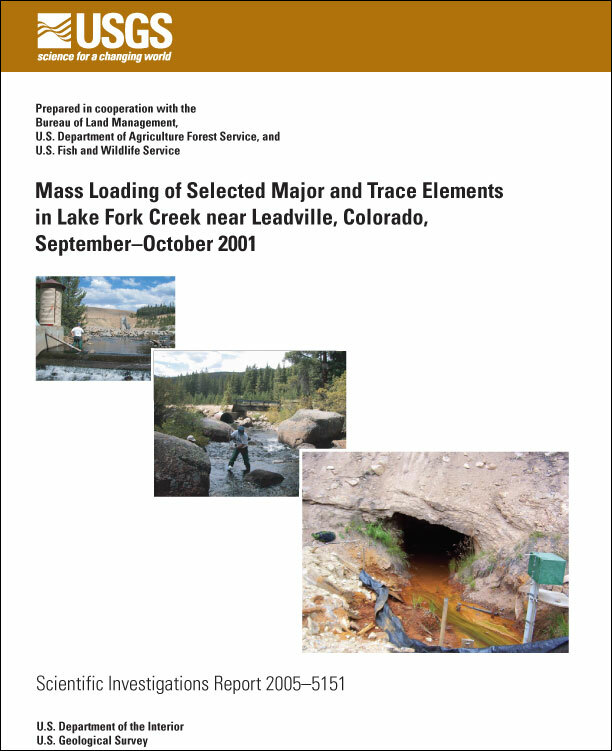 Walton-Day, Katherine, Flynn, J.L., Kimball, B.A., and Runkel, R.L., 2005, Mass Loading of Selected Major and Trace Elements in Lake Fork Creek near Leadville, Colorado, September–October 2001: U.S. Geological Survey Scientific Investigations Report 2005-5151, 46 p.
A mass-loading study of Lake Fork Creek of the Arkansas River between Sugarloaf Dam and the mouth was completed in September-October 2001 to help ascertain the following: (1) variation of pH and aqueous constituent concentrations (calcium, sulfate, alkalinity, aluminum, cadmium, copper, iron, manganese, lead, and zinc) and their relation to toxicity standards along the study reach; (2) location and magnitude of sources of metal loading to Lake Fork Creek; (3) amount and locations of metal attenuation; (4) the effect of streamside wetlands on metal transport from contributing mine tunnels; and (5) the effect of organic-rich inflow from the Leadville National Fish Hatchery on water quality in Lake Fork Creek. The study was done in cooperation with the Bureau of Land Management, U.S. Department of Agriculture Forest Service, and U.S. Fish and Wildlife Service. Constituent concentrations and pH showed variable patterns over the study reach. Hardness-based acute and chronic toxicity standards were exceeded for some inflows and some constituents. However, stream concentrations did not exceed standards except for zinc starting in the upper parts of the study reach and extending to just downstream from the inflow from the Leadville National Fish Hatchery. Dilution from that inflow lowered stream zinc concentrations to less than acute and chronic toxicity standards. The uppermost 800 meters of the study reach that contained inflow from the Bartlett, Dinero, and Nelson mine tunnels and the Dinero wetland was the greatest source of loading for manganese and zinc. A middle section of the study reach that extended approximately 2 kilometers upstream from the National Fish Hatchery inflow to just downstream from that inflow was the largest source of aluminum, copper, iron, and lead loading. The loading was partially from the National Fish Hatchery inflow but also from unknown sources upstream from that inflow, possibly ground water. The largest sources for calcium and sulfate load to the stream were the parts of the study reach containing inflow from the tribu-taries Halfmoon Creek (calcium) and Willow Creek (sulfate). The Arkansas River and its tributaries upstream from Lake Fork Creek were the source of most of the calcium (70 percent), sulfate (82 percent), manganese (77 percent), lead (78 percent), and zinc (95 percent) loads in the Arkansas River downstream from the Lake Fork confluence. In contrast, Lake Fork Creek was the major source of aluminum (68 percent), copper (65 percent), and iron (87 percent) loads to the Arkansas River downstream from the confluence. Attenuation was not important for calcium, sulfate, or iron. However, other metals loads were reduced up to 81 percent over the study reach (aluminum, 25 percent; copper, 20 percent; manganese, 81 percent; lead, 30 percent; zinc, 72 percent). Metal attenuation in the stream occurred primarily in three locations (1) the irrigation diversion ditch; (2) the beaver pond complex extending from upstream from the Colorado Gulch inflow to just downstream from that inflow; and (3) the stream reach that included the inflow from Willow Creek. The most likely attenuation mechanism is precipitation of metal oxides and hydroxides (primarily manganese), and sorption or coprecipitation of trace elements with the precipitating phase. A mass-balance calculation indicated that the wetland between the Dinero Tunnel and Lake Fork Creek removed iron, had little effect on zinc mass load, and was a source for, or was releasing, aluminum and manganese. In contrast, the wetland that occurred between the Siwatch Tunnel and Lake Fork Creek removed aluminum, iron, manganese, and zinc from the tunnel drainage before it entered the creek. Inflow from the National Fish Hatchery increased dissolved organic carbon concentrations in Lake Fork Creek and slightly changed the composition of the dissolved organic carbon. However, dissolved organic carbon loads increased in the stream reach downstream from the fish hatchery where some metal loads decreased, indicating that precipitation of metal organic complexes probably is not promoting metal removal in that reach. The greatest effect of the inflow from the National Fish Hatchery seems to be that it diluted Lake Fork Creek and lowered stream zinc concentrations below hardness-based acute and chronic toxicity standards.